What's your paradigm to winning new business? When building a business, it’s essential to make the distinction between sales and marketing. Most business professionals understand the need for sales and their importance to the livelihood of the organization and its future. What often gets missed is the leverage marketing can and should bring to a business and it’s overall goals. Sales are really the consummation of a business transaction. They’re the fruit companies strive to produce in their daily operations. I like to use the analogy of a wheel to better describe the difference between sales and marketing. If you view the wheel as a business, sales would be the spokes on the wheel. The spokes play a vital role in the wheel’s performance and are definitely a key element needed for the wheel to work properly. In the same sense, sales are essential in every business’s success. Marketing, however, is a more central element of business. In our analogy of the wheel, marketing represents the hub of the wheel. 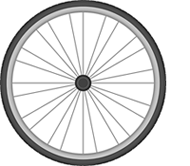 It is the core on which the spokes rely to facilitate their function of helping the wheel go around. Marketing is the platform on which a business conducts sales. It is the principle medium in which a company can educate and prepare potential clients to purchase products or services. It is the hub, or the heart, of a company’s communication with its clients and is the primary vehicle used to deliver that message. What makes marketing often more difficult for company leaders and business professionals alike is that it is more illusive than sales. Sales are easy to measure and keep detailed metrics on exactly how a company is or is not achieving its goals. They are much more tangible and effortless to see. But when it comes to building your business, sales are only part of the equation. In our analogy, sales are the spokes on the wheel. Marketing is the hub. Both parts must work cooperatively together in order for a business to thrive. Only through the leverage of solid marketing can a company maximize its sales and produce increased results. Just like the hub and the spokes work together to allow the wheel to do its job, your company should strive to have a paradigm where marketing and sales work together to build your business.